1. What are clearly defined goals for this campaign? 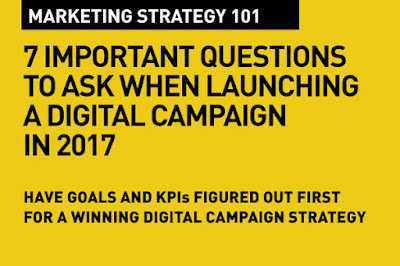 Before you can do any strategic planning, you want to know the absolute objectives of the campaign? What metrics will you measure? What are your goals? What results do you want to see at the end (or even half way through) of the campaign? 2. How do these goals align with our brand goals? I've been in a few meetings with clients where there was no agreement between marketing teams and overall brand guardians at companies. Because their goals are different. I;m not saying their goals need unanimous agreement, I'm saying you cannot have marketing campaign goals that have no resonance with overall rand goals. 3. What are we really driving here? Brand/product awareness or sales? Sorry, it's kind of difficult if you say you want to increase brand awareness and drive sales. Digital marketing needs to be a lot more focused. You can't have both. Your media plan, your target planning, your creative messaging will differ quite a lot when you want to one or the other. Do not have conflicting goals – because you'll have conflicting budgets. Brand awareness budgets have different sets of ROI's from budgets set aside to drive sales. Sales drives see immediate results – good or failed. Awareness drives are different. 4. What is this campaign about? A new product or service? What is the unique attribute that we want to underline? What are you really trying to get across? Are you announcing a new product or service? What is unique about it? What is the one attribute that you want to push through that will resonate with your target audience? What are the key things that you want your audience to discover? What do you want them to know? This question, or questions will help you drive the creative brief and result in a wtare tight creative message. This will also help you decide on which marketing channels you may want to use. 5. Who are we targeting? Where? When and How? What's the intent we want to resolve? This is 2017. Data is changing the way we make decisions (see post on how Data is driving marketing in 2017). Getting insights on your target audience, or your customer should really be a focus area for you before you embark on your campaign. Once you know who you want to target, you'll find defining an overall media strategy that highlights the Where, When and How a lot easier to develop. Over the last few months, and definitely into 2017, we'll see 'Intent marketing' becoming huge. Meaning, targeting by demographics is not really crucial – what is important is what consumer intent are you trying to resolve? What's the solution you will provide? And how are you going to tell them about that solution. So, it's not just 20-30 year old males, but any one really, who wants the latest shiny new iPhone. Even grandmas. It's now a lot obout in-the-moment intent driven targeting. In context. Read this: Intent is the new black in digital marketing. In-the-moment marketing is what's hot. Once you know what problem resolution you provide for your, it is important that you work out the Where, When and What. In 2017, you really ought to be on mobile. Thought that through? Are you going to use Paid Search? Content marketing? Blogs? Banner ads? What time of day? On which channel? Sure, there are specialized agencies who provide answers, but you need to ask the questions. 6. What creative messaging are we going to use that our target audience will identify with? You know your target audience and the solution tat they are looking for. You know about the unique attributes of your product or service. So what creative message (the content, the form or design, the call to action (remember goals?) are you going to use to make sure that you achieve the results that you defined earlier? You can get all other aspects of your strategy right, but if the creative does not cut through the huge clutter that's out there, you just will not be seen or heard. 7. How are we going to track, optimize, and ultimately measure the success of this campaign? Campaigns today aren't just born that way. Campaigns need optimization, they need tweaking, they need to adapt to performance. Which means tracking performance on an on-going basis is key. Make sure you (or your agency) have the right tools and the right metrics to track against the goals that you set out with. If your campaign isn't doing well in social, how are you adjusting your channel plans? If it isn't working on mobile as you anticipated, is the creative working in that limited mobile space? These are simple, basic questions you ask. And answer. And that's the basics. That's Digital Marketing Strategies 101. Please add your comments below, and do share it with friends. Great article! Thanks Tom for sharing this. There are many benefits which comes with digital marketing. It's estimated that at least 80% of people search for information online. Now-a-days online marketing became very popular (sea salt marketing). Nice blog & nice great comment! Thank for sharing the good idea....!!! Nice.This Blog helps in understanding very well about Digital Marketing Strategies in Optimizing your website and how to manage Campaigns. Thanks for sharing this article which is so informative regarding to Help Dissertation We also provided such type of facility for more info please visit our site. I enjoying your post. You definitely have some great insight and great stories. 5 YouTube Tips core ideas - news, trends, emotion, luck or evergreen content.